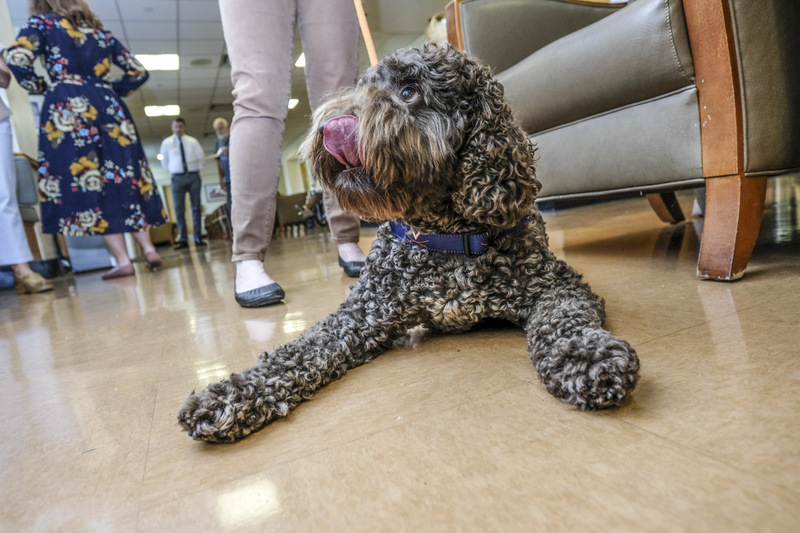 Kenny, the first resident therapy dog at the University of Virginia’s School of Nursing, spent the first two years of his puppyhood in training to provide comfort and relief to his human companions, thanks to his devoted handler, Assistant Professor of Nursing Edie Barbero. 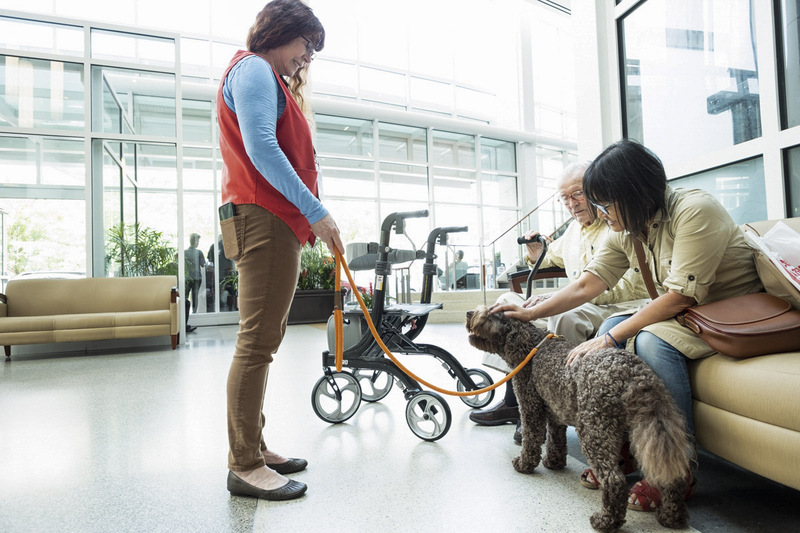 Now Kenny’s work takes him to the corridors of the UVA Medical Center, where he lifts clinicians’ spirits alongside a school-sponsored Compassionate Care Cart, a mobile station laden with snacks, water and schedules for meditation and yoga sessions. Kenny also makes regular appearances in nursing student lounges, where he tends the happy, the homesick, the exam-weary and the harried. 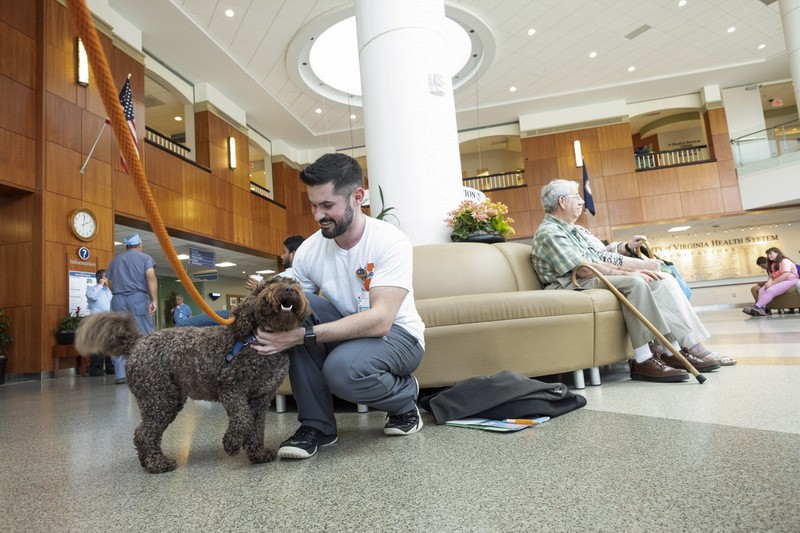 Certified last year through Pet Partners with owner Barbero, the therapy duo is primarily stationed in the School of Nursing, but they also work at UVA’s Medical Center once a week. Kenny’s good manners and love of humans make him perfect for the job. Because he is only 3, he is mainly stationed in the lobby or waiting areas, but once he is older he will work more directly with patients. Kenny also hangs around with staff wherever he goes, who are only too happy to get some of his puppy love. In fact, the affable tail-wagger has become such an ingrained part of the Nursing School that he will receive a special honor later this month. On Oct. 27, he and Barbero will attend the school’s Undergraduate Awards, Recognition and White Coat Ceremony, where second-year students will receive a special pin and a white coat as they begin working in real clinical environments. While he won’t be getting a white coat, Kenny will receive his own pin, which will be affixed to the UVA scarf he will wear for the special occasion.